The short biography below was written by his nephew, Jack Yeager. My name is John A. “Jack” Yeager. I am 78 years old, and the nephew of John Adam Yeager. Photograph of John Yeager courtesy of Jack Yeager. Henry and Lena had four sons, one died at the age of two on board the ship that brought them to America, and had to be buried at sea. There were two older surviving sons; Alexander John, nicknamed “Sandy,” was my father. He was eight years old at that time. The second and youngest surviving son was John Adam Yeager, nicknamed “Nig." The family came straight to Portland, Oregon from Norka in 1904, and in due time they both went to the old Albina Homestead school. My grandfather, Henry Yeager, a cobbler by trade, died in 1912, and what was so common in those days, both sons got jobs as soon as possible after their father died, to help support the family. As all the Volga Germans are aware, nicknames were extremely common in those days. My father was called “Sandy,” short for Alexander. But my uncle John’s nickname of “Nig” should perhaps be explained. With all due respect to all of our ethnic groups in this country, one must go back 90 years or son in time when our society was much more biased than we are now, as we are all aware. As a boy, possibly a young teen, uncle John would get a very brown tan, a trait that survives in our family today. So obviously, “Nig” evolved, and he was known as “Nig” Yeager the rest of his life. Growing up in our old neighborhood and including all of Albina was not easy in those days so long ago. Self-protection was a must, and the young men and boys of that era knew that knowing how to use your fists was a top priority. As I remember being told, “Nig” soon had a reputation that demanded respect, and became a person to be respected. But also, as I recall, he was not one to bully people, and had many good friends. Those were the dream days of boxing . . . . Right here in Portland a young fellow rose out of obscurity and in 18 fights over a four-year period his ring earnings were $14,000. “Nig” Yeager, they called him, or sometimes fancifully “the Duke of Albina,” but his real name, which I had never heard until last week, was John Adam Yeager. . . .
What became of the $14,000? The dollars came in a silver stream in those gone days of easy boxing money, but there was no stickum on them; they went out as fast as they came in – and probably would have from your hands, too, or mine . . . .
That boy Yeager had a thunderbolt punch. He weighed around 175, was tall, rangy and lithe in build, and when his right fist struck a chin it usually meant knockout. His first professional fight, in 1922, brought him $28.00, a spectacular knockout over an opponent of considerable experience, and so enthusiastic a fan welcome that his third ensuing ring appearance was as a main eventer, in the big money – and “big money” is right, for they really drew big money in that heydey of boxing . . . . 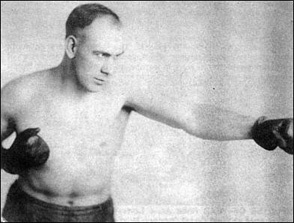 The Yeager bout the old-timers will remember was in 1925, Yeager against the sturdy “trial horse,” Frank Farmer, who wrecked so many budding young boxing careers - and while he didn’t exactly wreck Yeager’s he put a bad crimp in it by going the full ten rounds in a crouch and holding a left hand constantly in Yeager’s face that kept him so off balance he could never bring home is famous right, to take the decision. For all that it was a hefty financial evening for Yeager. Old Frank always was suspicious of unguaranteed percentages. On this occasion, for some reason, so were Young Carmen and Johnny Trambitas in the other ten-rounder of a double main event. Yeager was so sure it would draw that he took the gamble of guaranteeing $1,800, or $600 apiece, to the other three, in return for their percentage. He guessed right, and how Farmer moaned and groaned when, after paying them $600 each, Yeager left the armory with $1,999.75 as his share! I’m not sure whether this was Yeager’s last fight, but anyway he dropped out soon after while he still could have drawn big houses. His mother had always worried about his fighting, and to please her, he retired . . . . I saw Yeager’s last week to talk to for the first time since his fighting days. No longer the slim, trim athlete and one calls him “Duke of Albina” now, but he seems to be doing quite well for himself; and that’s more than so many ex-fighters do. He weighted 176 that night of the fight with Farmer – now it’s a bulky 275. He is business agent of Sanitary Truck Drivers local No. 203, which is the polite name for garbage wagon drivers’ union. After he quit boxing he became active in the labor movement. He lived in the old Temple Hotel for many years, across the street from the old Labor Temple in downtown Portland. Those were trying times back then, with much labor unrest because of low wages and poor working conditions. Because of his reputation, he became acquainted with a powerful teamster union executive out of Seattle, and eventually was asked to be the Business Agent for the Garbage truck Drivers Union Local # 220 here in Portland. He loved his job, working with men he grew up with, and many others he soon came to know. During World War II, he held down two jobs, his union job, and driving a truck in the shipyards of Portland. When I came home from the U.S. Navy after World War II, we got together and he told me of his plan to purchase the garbage business in Coos Bay, Oregon with one of his old friends, Philip "Paddy" Lehl. They went ahead with their plan, and went to Coos Bay at the end of 1946 and bought the Elwah Garbage Company in November. For the next 16 years he had a quite successful enterprise. Paddy's brother George Lehl joined them in the Coos Bay garbage business in the 1950s. Early on in his boxing he had married, but it soon failed. So, after being a bachelor for many years, he fell in love with Mrs. Timmons, a widow lady his age whose first name eludes me because severyone always called her “Timmie”. Well, "Nig" wanted to marry Timmie but there was a problem that first had to be solved. As was the case for many, "Nig" had a drinking problem. As I recall, he had an amazing capacity to indulge in strong drink and still function somewhat normally. Timmie had lost her first husband to alcoholism and wasn't about to go through that again. Well, love conquered all, and Nig quit drinking and never touched another drop, and the wedding happened. I’m sure that the next 15 years of his life were the happiest times of his life. He sure drank a lot of Royal Crown soda pop, definitely his favorite. Sometime in late 1960 he began to have medical problems, leading to a major operation for colon cancer at Emanuel Hospital. On September 6, 1962, he passed away in the Coos Bay Hospital. Nig Yeager was 64 years old. His body was transported to Portland and a funeral service was held at the Ross Hollywood Chapel. "Nig" was put to rest in an above ground vault in the Rose City Cemetery in Portland, not too far from his father Henry and his mother Lena. 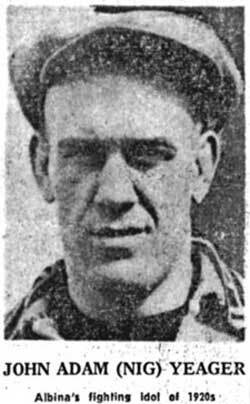 It was a very brief item, only one paragraph long and half-buried at the bottom of an inside page, that told of the death in Coos Bay of "Nig" Yeager, one-time fighting pride of the old Albina section of east Portland. However, it triggered recollections of a day when John Adam (Nig) Yeager from that fight loving area which turned out so many good fighters in its time, not only was king-fighter of the all but for a brief period the most exciting right many Portland has ever known. The “John Adam” mentioned above would have been superfluous at that time. No one knew he had any other first name than “Nig,” nor cared. As “Nig” Yeager he lived, fought, reached a peak high in the boxing sunlight, then had his wings singed and as suddenly as he rose plunged into boxing obscurity again; and it was as “Nig” Yeager that his death was announced. Yeager wasn’t the scientific best of Albina’s many good fighters, but certainly the most dramatic and spectacular, a heavyweight with a punch; other Albina fighters were smaller men. He not only could punch but could take a knockdown himself and still get up and fight some more, and these are among the elements of boxing popularity. The odd thing is that he rose from nowhere, and absolute unknown in the boxing game, into that sudden period of bright splendor, in which he packed in and stirred the fiery enthusiasm of the customers as no other Portland fighter ever did. He fought just 15 times. Of the first 14, all but four were knockout victories. Then came ill-advised No. 15 against too good and experienced a man and curtains! Yeager, John "Jack" Alexander (nephew of John Adam "Nig" Yeager). "A Short Biography of John Adam “Nig” Yeager." Handwritten in 2000 and used with permission of the author who died on December 9, 2013. BoxRec.com - June 14, 2015. Last updated November 12, 2016.